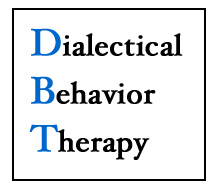 The Adult DBT Skills Training group is for people who would like to learn how to cope more effectively with intense emotions, problematic thoughts or behaviors (i.e. negative thinking, self-harm, substance use, suicidal thinking), and/or relationship struggles. WHEN: April 4 - July 11, 2019, 14-Week Program (we skip holiday weeks). FEE: $700 for each semester. Return to Main DBT Page.